PhD student Alberto Camacho at Google's offices in Mountain View, CA. Two computer science graduate students are the recent recipients of academic honours from Google. 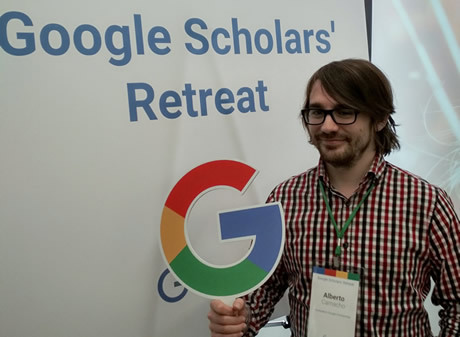 Google PhD Fellowship students are a select group recognized by Google researchers and their institutions as some of the most promising young academics in the world. Fellows are connected to a Google Research mentor while they pursue their PhD studies. Generation Google Scholarship was established to help aspiring computer scientists excel in technology and become leaders in the field. As part of the scholarship, Camacho attended the Google Scholars’ Retreat earlier this summer, held at Google's headquarters in Mountain View, CA. Camacho interacted with Google engineers and researchers from different teams and attended workshops, keynotes and social events. "There was an emphasis on the importance of leadership and having a positive impact on your community," said Camacho of his experience. "I also took advantage of the trip to meet Tyler Lu, who used to sit next to me in the AI lab, and is now a full-time researcher at Google."